My sister and her husband took their three kids to New York City this past July. My sister is an avid foodie who made sure that along with visits to the American Museum of Natural History, the Met, and Times Square, her kids also had a taste of New York’s famous deli sandwiches, pizza, and Crumbs cupcakes on their trip. Because of my sister’s passion, her kids have developed a particularly sophisticated palate. Her youngest daughter was eating sashimi without any garnishment of wasabi or soy sauce at the early age of four. The other two kids will eat things at yakitori restaurants that I don’t even try, such as, gizzard, heart, liver and cartilage. This is all to give you enough background to appreciate an exchange I had with my sister yesterday about Mulberry’s pizza. Well, Russell, our staff would wholeheartedly agree with you. So is this NY pizza with the thick crust, or is it thin crust NY? Patsy's, Lombardi's, John's, Joe's?? Or is it similar to that fancy $20 personal pizza in the east village??? Regardless, if and when I'm in LA, I shall definitely want a slice to compare!! 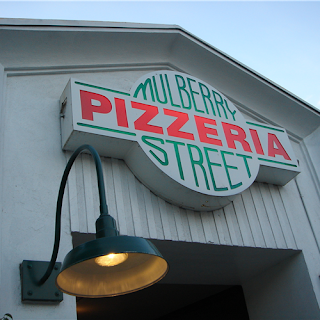 The Mulberry pizza is similar to the thin crust pizza at Grimaldi's in Brooklyn. Cheese only seems to be the consistent winner here. The other toppings are hit and miss. They have a no corkage policy there so bring a nice bottle of Chianti Classico Riserva or another Sangiovese for a nice wine pair. Cheers!